9.5" H, Resin and stone mix, embellished with rhinestones and metallic copper accents. Message: Blessed with maternal Peace and Love, the bond of a child in a mother's arms, so gentle and tender, so perfect ... so warm. 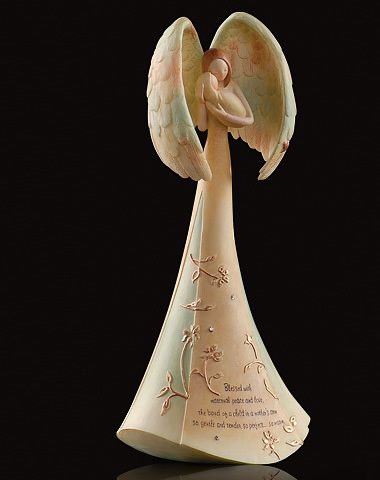 This motherhood angel honors all Mothers and their maternal bond with their children. Her wings wrap forward to provide a warm embrace of comfort and security. The flowers on her dress symbolize the beauty of new life.